Fret not, this is will not be a whiny continuation of yesterday’s post. Yes, I’m still under house arrest and, yes, still in quite a frightful load of pain but neverending pity parties aren’t much fun. Not for the host. Not for the guest, right? We attempted to shower today, and it was an acrobatic experience involving crutches, foldable step and bar counter stool. Another necessary prop was the trusty Cling-wrap. I finally saw what the surgeon had done and understood the pain levels. 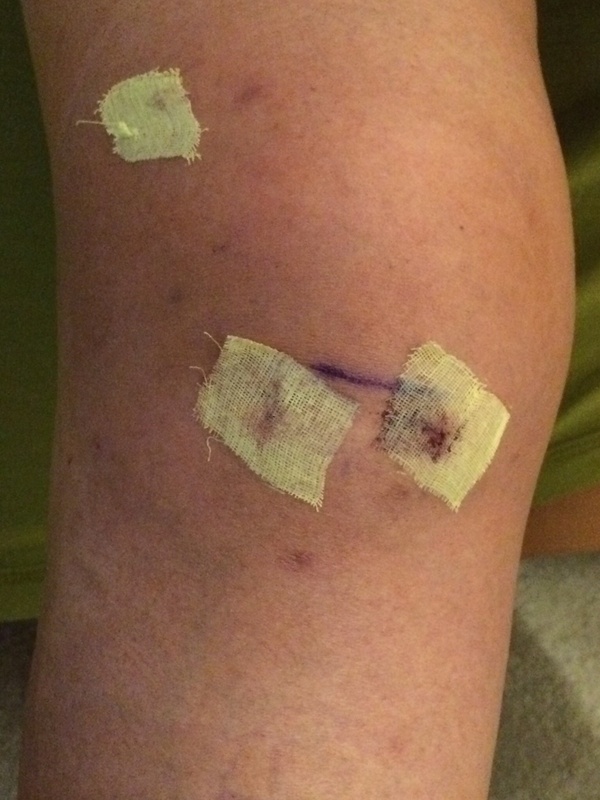 There were three deep incisions instead of the two I’d expected. There was quite a bit of bruising and bleeding; the gauze pads were crusty with dried blood. But everything looks as though it’s as it should be, so I’m relieved 🙂 here’s to surviving another day tomorrow without going out of my mind with boredom. This is, afterall, a day-by-day chronicle of my situation so the photo had to be shared. Ouch! Kudos for not whining more than a day. But, just so you know, you’re entitled to whenever you like. That looks terribly painful. Quick healing vibes coming your way.